My family never experimented much with cooking, flavor, or different cuisines. We would eat hotdogs at cookouts, lasagna (as per my request) on my birthday, and chicken wings on Super Bowl Sunday. Pretty basic stuff. We didn’t want to splurge on unnecessary foods or buy too many fresh ingredients. Simple and cheap was always better. My junior year of high school, I began to experiment with cooking. The first dish was simply just fresh green beans with some garlic. My family loved the flavor of fresh garlic; who would have known that you could use spices other than salt and pepper and sauces instead of butter. From that moment forward, my lemon pepper garlic green beans were requested on holidays and special occasions. So, I began to experiment and buy my own groceries continuing through senior year of high school. I would cook dinners for myself, trying to adapt to some sort of healthy option. 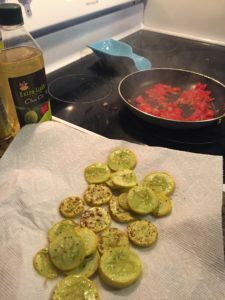 I tried using zucchini for crust on pizza and bought pounds of veggies to make Ratatouille (I was inspired by my French class and the movie of course). And to my surprise, I loved cooking.. and my food actually tasted good. During my Freshman year of college I had nothing to eat but food from the dining halls. I was reverted back to easy mac and ramen packets in my dorm room as well. However, my most incredible inspiration came from studying abroad my sophomore year. Italian, Greek, French, Spanish foods. All authentic. All delicious. Then came the cooking shows. Top Chef, Master Chef, and any baking show that would incorporate thinking on one’s toes and using odd ingredients to make something delicious. Since my travels and constant inspiration to use ingredients in an unexpected way, I have adopted some favorite recipes that friends and family devour and also don’t break your budget. I took my inspiration from the cooking from my youth and adapted some delicious and fun to make Good Lookin’ Cookin’recipes. My interest in French culture has existed since my first exposure to the language and culture in 8th grade. 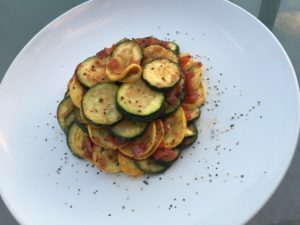 I was inspired to make Ratatouille after I saw the Disney movie Ratatouille. The tiny rat, Remy, plated a beautiful and forgotten old French recipe and served it to a food critic. I used this inspiration to try to make this dish for my high school French class. They loved it (and teens don’t typically eat veggies). In my particular adaption of the Good Lookin’ Cookin’ recipe, I eliminated the eggplant and peppers to save a bit of money. I focused on the joy of cooking the dish and the plating (which is surprisingly fun rather than simply plopping the food on a plate). Heat olive oil to medium heat on a skillet. Cut zucchini and squash as thin as about a quarter width (if possible). Cook zucchini and squash in the skillet until lightly browned or softened. Drain the can of diced tomatoes. Dice the red onion. In a different pan than the zucchini, begin to cook the onion. Next, the drained tomatoes should be added once the onions are cooked to a translucent state. Then, cook them until the mixture is thoroughly heated. Season zucchini and squash with salt, pepper, and garlic powder. Add a dash of cayenne pepper (optional). 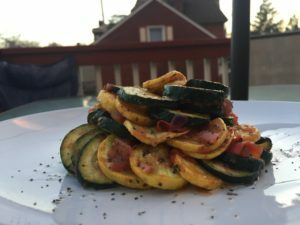 Combine zucchini and tomato mixture, plate, and voila! Feeling “un petit francais” yet?